The Pentrich and South Wingfield Revolution Group was established in February 2012, to increase awareness of the 1817 Pentrich Revolution and establishing a permanent legacy of this little known but important historical event. The Executive Committee comprises of members from local history societies, together with members of local parish and town councils and others who are simply interested in preserving the heritage. To build an organisation to highlight the Pentrich Rising of June 1817 and to commemorate its bicentenary in June 2017. To raise awareness of the Rising and elevate the event to its rightful position in local, regional, constitutional and national history of the 19th century. To create an organisation which will develop and deliver an on-going legacy for future study, awareness and commemoration. To build and consolidate partnerships and alliances with all interested parties, organisations and agencies. To raise sufficient finance to ensure the sustainability of the organisation and the promotion of its activities both for the bi-centennial events and thereafter. The Pentrich Revolution, Derbyshire Rising and Pentrich Rising are all names that describe an event which took place between South Wingfield and Eastwood on the Derbyshire / Nottinghamshire border in 1817. It involved three to four hundred poorly armed men taking part in what they were led to believe was to be a ‘general rise’ across the North and Midlands to replace the Government. As a partly government inspired provocation, with the State being well aware of the march, this national rising was quickly routed with subsequent staged trials being used as a deterrence to quell and prevent other possible sources of discontent in the country. Three of the leaders were subsequently hanged and beheaded with 14 marchers transported to Australia and 85 jailed. Described by the eminent historian, the late E.P Thompson, as one of the first events that marked the formation of the English working class, this heritage needs to be more widely understood to take its place alongside other significant and better known instances of popular radicalism and civil confrontation that took place in this era such as the 1819 Peterloo Massacre. 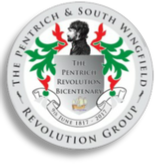 In redressing this omission, the Pentrich and South Wingfield Revolution Group seeks to inform the general public and the residents in those communities in and around the route of the Rising of their historic antecedents whilst ensuring a legacy that remains accessible to succeeding generations. A number of regional partnerships have been established. There is an annual subscription of £5.00, please contact the Secretary, Valerie Herbert initially as we are in the process of appointing a Membership Secretary.